Rule #5: You get no leeway for being a Maker. 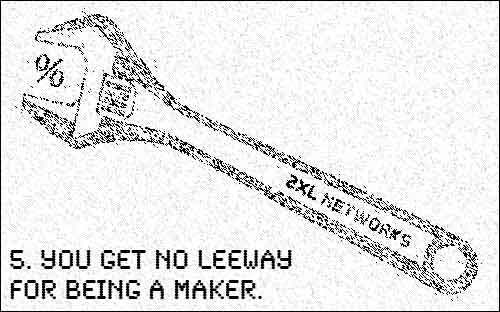 All that said, I don’t expect any leeway for being a maker, but I guess I am hoping for some leeway because I’m just one guy trying to help people out by providing a product they want. I’ll go above and beyond to help customers if things don’t work right, and I hope they’d be understanding of the fact I’m just a small business trying to make simple things, and not some huge corporation trying to make a million dollars. Maybe that’s my expectation because that’s how I look at things. I do tend to give makers leeway because I usually believe that they are in business doing what they are doing more for the love of it than for the money, and I value that, and want to see them succeed, and if it means I give a little leeway, than so be it. So going back to “The customer is always right. Even if they’re being a jerk” line… I try really hard not to be a jerk customer, and I just hope other people do the same thing. Posted on Monday, February 27th, 2012 at 6:00 am. Subscribe to the comments feed. Both comments and pings are currently closed. Post on your own blog.